All Men Must Die. This premium collection of coins features characters whose deaths we have witnessed. Many were great and terrible men—some were just boys. Spoilers! The packaging contains information on how each character meets their end. Each coin is made one at a time in the USA using antique coining equipment and traditional techniques. 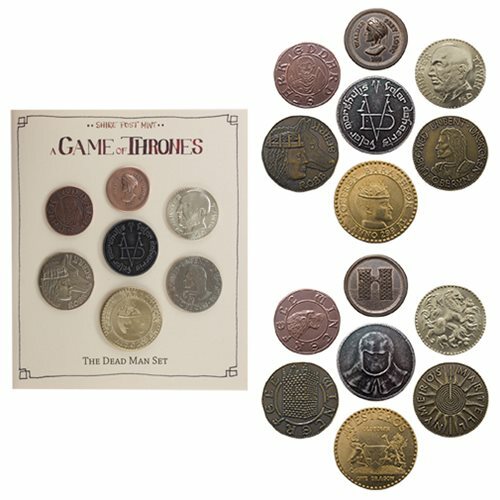 The set comes with an information sheet with details on each coin and character.? Officially licensed A Song of Ice and Fire merchandise. The Iron Coin of the Faceless Man - the pure iron coin made by the organization of the Faceless Men. Eddard Stark Half-Groat - Eddard "Ned" Stark was head of House Stark, and Warden of the North. The Half-Groat denomination is worth 2 copper Pennies. Robb Stark Half-Dragon - shown with his direwolf Grey Wind. Joffrey Baratheon Golden Dragon - king on the Iron Throne after his father, Robert Baratheon. Oberyn Martell Half-Dragon - the Red Viper, is a skilled fighter, scholar, and diplomat. Tywin Lannister Half-Dragon - head of House Lannister, one of the most powerful lords in Westeros, and father to Jamie, Cersei and Tyrion Lannister. Walder Frey Penny - the Lord of the Crossing and head of House Frey. Ages 15 and up.